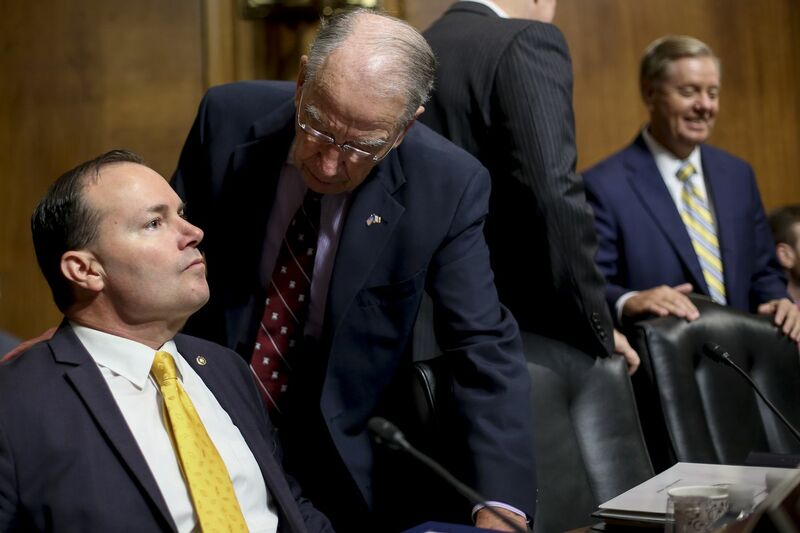 Senate Judiciary Committee Chairman Chuck Grassley of Iowa (second from left) speaks with Sen. Mike Lee, R-Utah (left) before a meeting of the committee last year. Sen. Lee has proposed an act to allow internationally built and operated vessels to engage in trade between U.S. ports. The president has received from one of his employees, Commerce Secretary Wilbur Ross, a report that probably tells Ross’ employer what he wants to hear: that imports of cars — “The Audis are coming! The Audis are coming!” — threaten “national security.” This report is required by our lackadaisical Congress so it can pretend to be involved in setting trade policy. After the president’s yes-man says “Yes” to the national security threat, the president can unilaterally raise taxes (i.e., tariffs which are paid by Americans) to slow the flow of cars to Americans who want them. The Utah Republican, he of the white shirts, blue suits, subdued ties, and measured words softly spoken in stately cadences, lacks the demeanor of a brawler spoiling for a fight. He has, however, just picked one concerning a small sliver of something vast — crony capitalism disguised as patriotism. One of the nation’s geographic advantages — tens of thousands of miles of coastline and inland waterways — has been minimized by making it off-limits to foreign competition in transportation. This increases transportation costs, which ripple through the production process as a significant portion of the costs of goods. Because of the Jones Act’s costly mandates, less cargo is shipped by water, merchant mariners have fewer jobs, and more cargo is carried by truck, rail, and air, which are more environmentally damaging than water transportation. Two of America’s most congested highways, I-95 and I-5, are along the Atlantic and Pacific coasts, respectively. Yet the amount of cargo shipped by water along the coasts and on the Great Lakes is about half the volume of 1960. Since then, railroad freight volume has increased about 50 percent, and volume by intercity trucks — responsible for 75 percent of federal highway maintenance costs — has increased more than 200 percent.